So the first item people need to consider before saving money for retirement is that it's going to take a lot more commitment and money to help them accomplish their retirement dreams. We need to encourage saving more than the industry standard 10% of earnings, because that mantra has been touted for years, and it's clearly just not enough money for the average individual as the above graph clearly shows. It's always difficult to make future projections with respect to the U.S. Economy because there are a myriad of factors that make an impact. While there are many moving parts to the U.S. Economy, one item will dramatically impact retirement income, and that's the future tax rate. As of this printing, the current national debt is $19 trillion. If you add in the unfunded liabilities within Social Security, Medicare and Budget Deficit, you're looking at over $101 trillion, and we have zero set aside to pay these liabilities. Politicians will need to consider a minimum of two avenues. First, find ways to increase federal revenues, typically this is done by increasing taxes. Second, they need to find ways to decrease spending, typically this is done by cutting government programs. Neither of these options are appealing to politicians running for office, regardless of which side of the aisle they are sitting on. If your clients are just using "tax-deferred" retirement sources, like IRAs or 401(k) plans, they could be deferring taxes during a period of low tax rates, and consuming money during high tax rates. This just doesn't make sense. Instead, they should consider options such as Roth or properly structured cash-value life insurance. Both of these options start with "after-tax" contributions, they grow tax-deferred and when you take income there are no tax consequences. I've asked this question to many, many people over the years to get a gauge on their risk tolerance levels with respect to their retirement accounts, "When you get to retirement, how much of your money do you want to have in your accounts ... some of it, all of it or none of it?" Ironically, everyone answers, "All of it." I then follow up with the question, "Then why are you saving it in a place where you might have some of it or none of it?" They never have a good answer to that question. If you could predict where the market will be on any specific date, you would avoid all the losses and only participate in the gains. Sounds like a great strategy. Products like Indexed Universal Life insurance do something very similar. When markets go negative, you simply earn zero. When markets go positive, you earn up to a pre-determined cap. Over a long-term, such as the length of time most people prepare for retirement, Indexed Universal Life policies produce returns on pace with the market. Some risk is okay. We're not saying that all retirement funds should be in an IUL policy, but for the client who wants all of their money at retirement at least a good portion of their plan should be allocated to IUL. Our industry typically pushes qualified plans (IRAs, 401k plans) as the primary way people should prepare for retirement, but the one thing that qualified plans don't do well is self-completing a retirement plan when someone dies prematurely. While it's not something a lot of people like to think of, but death is a certainty, the only question is when will it happen. Actuaries love to talk about mortality tables and life expectancies. What most people fail to realize is when you are talking about life expectancy, that simply means by that specific age half of the people will already be dead, the other half are going to be living. Which half are you going to be in, the first or second? All of us think it's going to be the second ... but that's not always the case. When you die prematurely with a qualified account, as that passes to beneficiaries, so too pass the tax deferrals, but eventually those taxes are paid when distributions are taken. Also, if you're just starting contributing to a plan, such as in your early 30s or 40s, your beneficiaries only receive the actual account value (see average account table above), there are typically no additional "death benefits" in an IRA or 401(k) plan. Life insurance when properly structured always pays a significant tax-free death benefit, typically well above and beyond original contributions. So if you want to self-complete retirement plans or other financial objectives, the better product to consider is cash-value life insurance as a supplement, or even replacement, to your typical qualified plans. Plan Administration Fees -- these cover the day-to-day administrative services including record-keeping, accounting, legal and trustee services. Individual Service Fees -- these are the fees to conduct specific individualized services, such as fees associated when taking out a loan. The size of your 401(k) plan often dictates the costs, because small plans costs a lot more to run. The reason, you lose the economies of scale you have with the large plans. According to Brightscope, the average 401(k) plan costs in 2011 were 0.94% for plan assets under $50 million. So on average, an individual could be paying close to 2.2% in total fees, and that's applied to the entire account balance. When the account grows, so does the cumulative fee. Assume that you are an employee with 35 years until retirement and a current 401(k) account balance of $25,000. 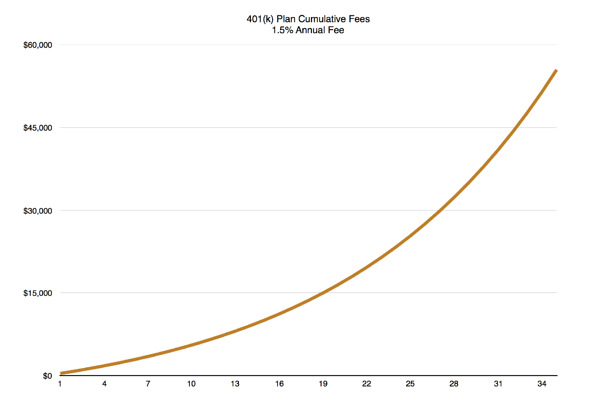 If returns on investments in your account over the next 35 years average 7 percent and fees and expenses are 1.5 percent, your cumulative fees would add up to more than $55,000, at retirement (see chart above). And those fees would continue to add up if you keep your retirement savings in a 401(k) while you distribute retirement income. And what are you getting for those fees? Headaches, worry and uncertainty are the words that typically come to mind when people talk about the stock market. Cash-value life insurance, such as Indexed Universal Life (IUL) also has fees, but for those fees are providing valuable death benefits. In fact, after a 10-year holding period, some IUL products actually have negative fees, which means over time your fees actually decrease to the point where they reach zero. If you continue to hold the policy after the fee expense reaches zero, your negative fees actually start positively adding to your policy's cash value ... I haven't seen a 401(k) plan do that yet. To unlock the power of Indexed Universal Life (IUL) you need to be able to position the product in a way that compels the client to take action. Not only does this webinar walk through a powerful software program that can be used with clients, but it also shows you how to generate more leads by providing turn-key marketing programs, seminars, and brochures.